After a 2 day drive through Arizona, New Mexico and West Texas, 2 girls, 7 boards, 7 paddles, clothes and a cooler came roaring into Austin on a lovely Memorial Day! We came into town with a few days to spare before the clinics started, which was great because our Austin posse, Camille, LC, Greg, Carrie and Angela had lot's of activities lined up for us to do during our stay there. The first thing we wanted to do was paddle Town Lake, also known as Lady Bird Lake, and get the lay of the land, or water in this case. Town Lake is a paddlers paradise! Perfect flat water paddling, no motorized boats allowed, clean, lot's of beautiful wildlife, it is great! Our friend Camille brought her dog Sadie Sue with us to paddle that first day. Sadie fell in love with paddling and ended up paddling with us everyday of the camp, and she became the official mascot and got the most attention from paparazzi!! There are heaps of other lakes around the Austin area to paddle, but for the Siren Clinic we stuck to Town Lake since there is no boat traffic and is fairly protected from the wind. Each morning we would meet at the base of the MOPAC bridge, do a quick land lesson then we would hit the water. The group would paddle towards downtown Austin then we would take a detour through Barton Springs. Barton Spring is BEAUTIFUL! It is a naturally spring fed creek, crystal clear water that was perfect for what I call SUP Snorkeling, checking out what is beneath the water from standing tall on the Stand Up boards. Turtles, Bass, Alligator Gar, and the rare Texas Blue could all be seen in the creek. On May 29 Austin Canoe and Kayak hosted a SUP in-store class and demo. 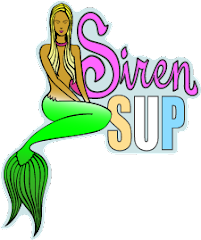 We had a nice crowd gather to check out the new Siren SUP line, meet the Siren team and everyone got to take home some cool SUP swag from Siren, Costa Del Mar and Kialoa! Congrats to Carrie Leighton for taking home an awesome new pair of Costa Del Mar's, the BEST polarized sunglasses out there! We meet so many great people in Austin and cannot wait to come back! We are already planning another trip there to paddle and eat BBQ as soon as possible. Thank you to all my great sponsors who support me and helped make this clinic possible and a success! Siren Surfboards and Kevin Shaughnessy, Costa Del Mar sunglasses, Kialoa Paddle, Wildcoast and a big thanks to my great friends in Austin who took such great care of us during our stay! Also, a big shout out to the newest superhero out there picking up trash all over our American waterways and oceans, Super Cat and her Plastic Revolution!